I am not sure what it is, but teenage boys just stink. It isn’t just their body odor either. I have yet to find a boy’s room that doesn’t stink. For us, having these boys in the living room, means that I have to work even harder to keep the smelly boy smell away. There is the smelly, sweaty smell coming off them. The fact that both boys are always fussing with cars, so there is the greasy, gassy, engine smells hanging around. And what the hell dies in their shoes that make them smell like that. These 2 boys have shoes that would make anyone cry. Make sure the boys take a shower. Every single day. Don’t let them say I am just too tired or that they didn’t get into anything. Shove them in the shower and tell them to scrub. And use soap. And wash their hair. Seems like the boys we taught as small children how to clean themselves, forget it when they become teens. Take care of those shoes. I don’t know what those boys do to them but HOLY COW! Those shoes stink. There are a few ways that you can combat that smell. First off, make sure those boys are changing their socks everyday. I don’t know what the thought process is, but moms everywhere tell me that the boys want to keep wearing their socks over and over again. My boys seem to have a contest over getting their socks to get up and walk away on their own. This only adds to the reek. Make them change those socks. 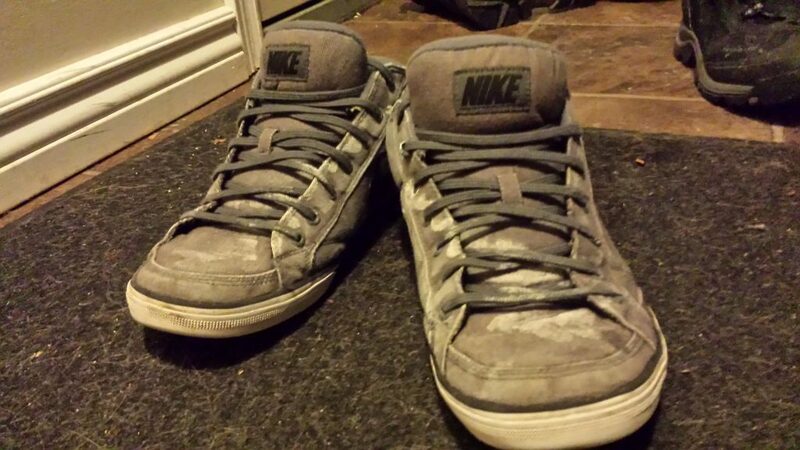 If the shoes already have the death odor, there are a few things that you can do, besides trash them. Start by getting charcoal odor absorbors. These are just small things to add into the show when the boys are not wearing them. If one or two of them are not enough to get the odor under control, try adding 2 of them in the shoes, and placing the shoes into a plastic bag. Then add another one into the area outside of the bag. Do it every night and it should remove the stink. Another option is to use baking powder. Load the shoes up and dump it out in the morning. It isn’t as good as the charcoal but it works in a pinch. Get rid of the gym bags. Be careful that the gym clothes, sport clothes, whatever, are washed right away. Don’t let them throw them in a corner and get forgotten about, or get shoved under the bed. I know, boys would never do that, but just in case, make sure they are not around somewhere. And make the boys change when they come home. Better yet, change and shower, but at least change. Otherwise, that sweat is transferring to the couch or bed, and now there is an even bigger smell. Use a good air purifier. An air purifier can help keep the air from getting stale. When the air doesn’t change out of a room, the boy stink just sits there. Even with the windows open, unless they are open all the time, the air just tends to sit in the room. The air purifier will take the bad smells out, as well as the dust and allergens that are floating around the room. Make sure that the air purifier contain a HEPA filter. You can even go one step better, and really use the filter to get out Boy Stink by using a Febreze Air Purifiers. Not only do you have an air purifier that can remove 99% of the air pollutants in the air, it also gives the added benefit of releasing Febreze into the air. 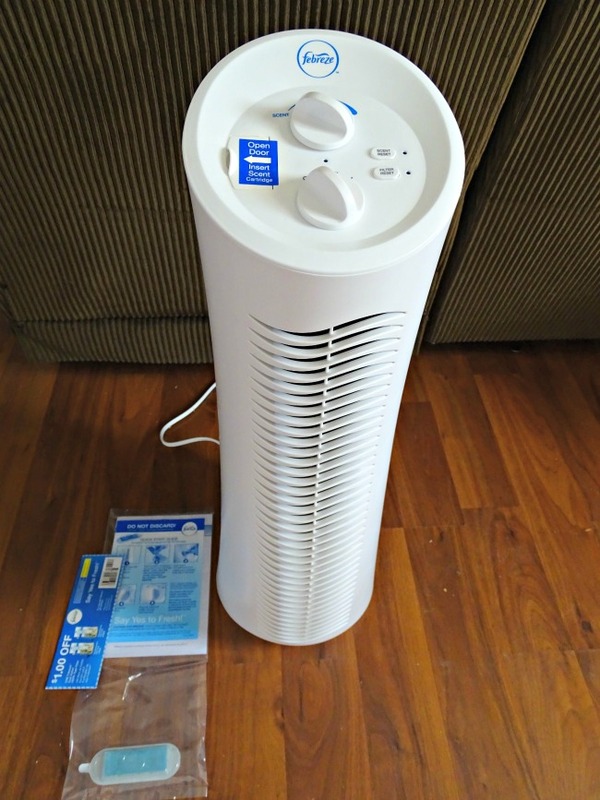 Febreze Air Purifiers includes Febreze linen & sky scent cartridge that lasts up to 30 days, and it is easy to buy replacement scent cartridges. There are 3 levels for air-cleaning, depending on the issues that you are facing, and there is a freshness scent control dial to easily change the purifier to your needs. The purifier runs quietly and is available in 3 sizes, tabletop, mini tower or tower. In our living room, we use the tower to control the boy stink going on. 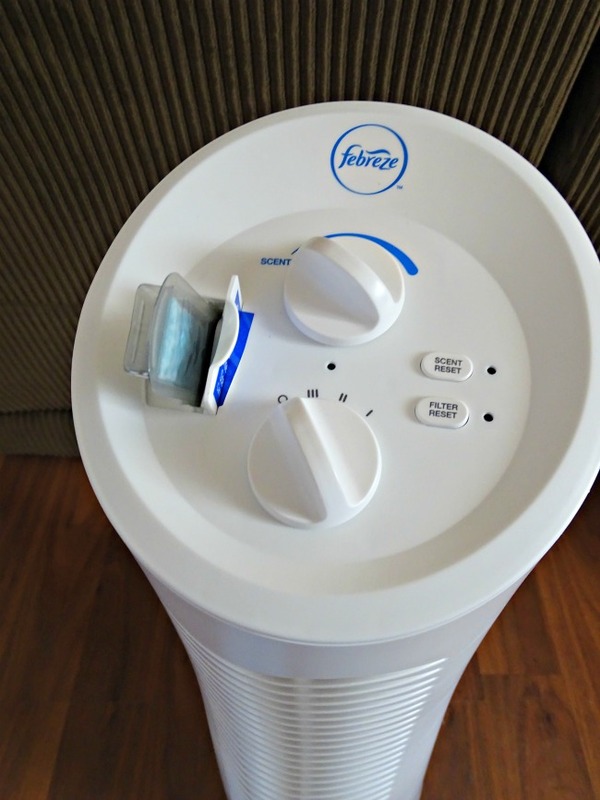 We fell in love the with Febreze Air Purifiers because of the benefits of the air purifier. It keeps the dust to a minimum, which is needed because my girls are allergic to dust and can cause their skin to break out and for them to get very congested. Also, with so many people living in our house, I swear someone is always sick. Using an air purifier keeps everyone feeling better. Whether you are dealing with boy stink or pet odors, or just dust, the Febreze Air Purifier handles it. What are you ways of controlling boy stink?